Why should I get a Salary Calculation? Calculate the salary that you will need in Santiago based on the cost of living difference with your current city. For only $49 USD you will know the salary you need in Santiago to maintain your current standard of living after you move. You will get a 14-page downloadable report calculating the salary you'll need. This independent calculation will help you justify your salary demands in your negotiation. Our data is regularly used by the most demanding companies and organizations, in economic textbooks, and in general media as a primary source.` The data behind your calculation is also used and trusted by the Markets Research division of Deutsche Bank, by Lloyds TSB International, by HSBC, by NatWest, by the BBC, and by Business Insider among others. With your salary calculation you will find out the salary that you will need in Santiago to keep the same standard of living that you currently have in your current city. Maybe just as important, you will have an independent assessment and hard data showing why you require that salary. This will give you a stronger position to negotiate a better offer. The calculation that you will get includes all the underlying price-data used to calculate the cost of living difference and the salary conversion. This is rock solid data that you can trust. “The calculation was really helpful to form a realistic view of the cost of living between the two locations. It was also a valuable reference point in the communication with the HR department when discussing the offer. Calculates the equivalent income in Santiago of your current net income. Abundant data points from multiple redundant sources. Includes graphs, sample prices, and key statistical parameters. Only recent, up-to-date prices used as inputs. Our salary calculations are based on data collected by us in Expatistan.com, a collaborative database of prices that is constantly updated and improved. In the last week alone we've added more than 5,300 new prices to the database. After aggregating, cleaning up and modelling this data, we cross check it and enhance it with public cost-of-living data compiled by international organizations like the United Nations, the World Bank and Eurostat. The end results are up-to-date, reliable, and comprehensive salary calculations on cost-of-living differences and net income equivalences. What will you find inside the salary calculation? The equivalent salary that you'll need in Santiago to keep the standard of living that you are used to in your city. 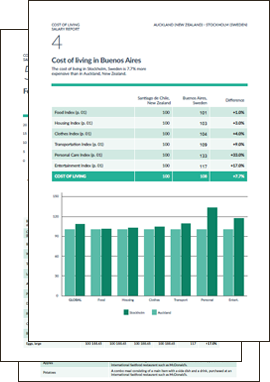 How much more expensive is the cost-of-living in Santiago, broken down by category. Abundant, up-to-date data. In the last week alone we've added more than 5,300 new prices to our prices database. Sample of prices of every-day items in both cities, as well as key statistical parameters. Professional formatting and reliable presentation, allowing you to use the printed calculation in your negotiations. The calculation that you will get combines the biggest cost-of-living database in the world (which we run ourselves) and public data sources, such as the United Nations, the World Bank, the OECD and Eurostat. The PDF document provides detailed cost-of-living information, based on which we calculate the salary that you need in Santiago to compensate for the difference in prices with your city. You will know exactly how much more (or less) money you will need in Santiago to live as good or better as you now live in your city. Even better, you will be able to explain and justify your salary requirements during your negotiation. You will be getting a comprehensive and reliable salary conversion for Santiago. Get started by downloading a 100% free sample calculation. See for yourself how useful having the right data will be when relocating to Santiago. How reliable are these salary calculations? Our salary calculations are primarily based on the largest database of prices in the world, which we compile and aggregate on Expatistan.com. The same data behind these salary calculations is used to power the analysis and tools of, among others, Lloyds TSB International, the Markets Research division of Deutsche Bank, and HSBC studies. To make sure that they are even more accurate than the data reported for free in Expatistan.com, we cross check and improve the information contained in our database of prices with public databases and cost-of-living indices published by reputable and trustworthy organizations, like the United Nations, the World Bank, and Eurostat. The result are up to date and comprehensive salary calculations. You should also note that we only provide paid salary calculations for a fraction of the 2,341 cities that we have data for. Only the cities that pass our rigorous checks and conditions regarding recency, consistency, and abundance of prices for all the items used in the cost-of-living basket are available in this section. How much does a salary calculation cost? The price of a full salary calculation is only $49 USD. There has to be something wrong with these salary calculations if they are so much cheaper than the ones offered by Mercer, or AIRINC. There's nothing wrong about the salary calculations. Actually, for individual expats our salary calculations are more realistic than the ones offered by the big multinationals. How can we offer our salary calculations much cheaper than them? First, multinationals usually don't sell their reports to individuals. They sell directly only to companies, which are able and willing to pay much more than individual expats can. So they price their reports accordingly high. We are trying to make quality salary calculations available to normal expats, and our price reflects that. Second, those multinationals base their reports in lenghty surveys that they need to manually administer, collect, clean and aggregate. This needs a big staff that they need to pay for. In Expatistan everything is automated and the bulk of our prices come from normal every-day expats that enter the prices themselves in the free version of Expatistan. To improve on these prices, we also use public sources like the United Nations, and the World Bank that are open and free to access. At the end of the day, we have more up-to-date, more abundant data than Mercer and AIRINC, but unlike them we do not have to pay a lot of money for it. In short, we can produce our salary calculations with a fraction of the costs that a big multinational can. Third, we also sell the salary calculations spending a fraction of the cost that they have. We do not have a sales organization in Expatistan. Or any overhead, for that matter. We sell our salary calculations directly to you from the internet, without a sales consultant spending days or weeks trying to convince you to buy other related (and usually unnecessary) products. We don't have to pass big overhead and sales costs down to you. Those savings are also reflected in the price. Is there a free version of the salary calculations? No, all the salary calculations are paid. You can download a free sample to see how a salary calculation looks like and check if it is what you need, but the customized version of the salary calculations for the cities of your choice are paid. You can always use the free version of Expatistan, though. Our salary calculations use as one of the inputs the same data that you can explore for free in Expatistan, and you can make the salary conversion yourself using that data. However, the free version does not calculate the salary equivalence for you, it does not include any extra sources of data with improved reliability, does not provide a nice, downloadable and printer-friendly salary calculation, and does not include extra graphs, sample prices, or statistical parameters. If you just need to know the basic difference in cost-of-living between two cities, you should definitely use the free version of Expatistan. If you are looking for more reliability, a salary equivalence calculation, and a printable salary calculation that you can easily share and use in your salary negotiations you should get a salary calculation from this page. Are the results of the paid calculations the same as the ones available in the free site? Not necessarily. The results in our reports and in the free comparisons in Expatistan can be (and often are) different. The principal reason for the different results is that although the paid calculations use mainly the prices and indices in Expatistan as their data source, they also cross-check and improve the data from Expatistan with data available from reliable third-party organizations like the World Bank and UBS. Another reason that may increase the differences between the free and the paid calculations is that for our index (i.e. the free comparisons from the main Expatistan website) we make the comparisons not directly but via a third city (Prague) to be able to construct a coherent index and ranking. In the reports we compare the cities directly, which bring more accurate results when you do not care about rankings of multiple cities among each other and only care about the direct cost of living difference between two specific cities. These two different ways of comparing cities usually create additional differences in the comparisons. In short, the paid calculations make use of a better and more reliable methodology to compare cities directly and they use an improved dataset compared with the free comparisons available in Expatistan. This can lead to different results. Which cities do you provide salary calculations for? We take the accuracy and reliability of our salary calculations very seriously, and we only generate salary calculations for those cities on which we have truly abundant, up-to-date, and reliable data. We currently hold data for more than 3,000 cities. Most of those cities have abundant and reliable-enough data for us to provide basic cost-of-living information in our free version, but we feel that our paid salary calculations should only be available for cities on which we have data that our statistical model and algorithms show to be reliable beyond a doubt. At the moment, we offer paid salary calculations for 311 cities. You can find them all in the dropdown city selection menu of the form to build your own salary calculation. Can I remove or change one of the categories of the cost-of-living index? At the moment, no. We are working on improving the salary calculations and we will eventually offer this possibility, but currently it is not possible. How can I pay for the salary calculations? Yes. This website, including your account and payment pages, is protected by SSL encryption. Additionally, we do not collect or store any credit card or other payment details on the site at any time. When you are ready to make a payment, your credit card details will be processed directly by either PayPal Inc. or by Braintree Payment Solutions, LLC through SSL encryption. All orders are processed exclusively through our payment processors' secure gateways, and at no moment do any of your payment details even touch our servers.